Will liberal talk really overtake conservative radio? This time the Left will really have good talk “radio” … One of the supposed bright lights for the Left during the presidency of George W. Bush was the creation of what was being billed as the rise of liberal talk radio. That outlet was Air America. It didn’t last long because it just wasn’t that good and people didn’t listen. But this time, now that there are podcasts, David Faris, writing at The Week, promises it will be different. Listener numbers … Faris claims that Pod Save America gets 800,000 to 1.1 million listeners. He doesn’t say if that is per podcast or monthly. Depending on which measure of podcasts you look at, that particular podcast comes in somewhere in the top 20 of podcasts, which is good. Most conservative talkers have proprietary ways to deliver archived shows that go around the podcast infrastructure, so comparisons are difficult. 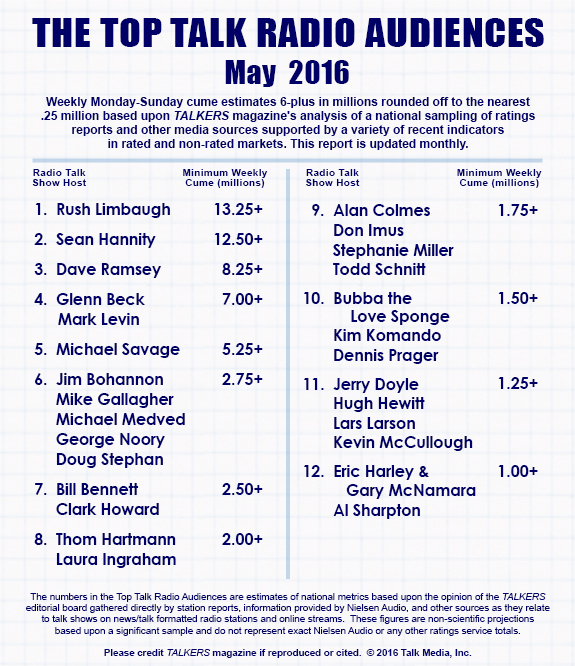 But let’s look at listener numbers The top five talkers all averaged over 5 million listeners per week in May 2016; all but Dave Ramsey are conservative political shows. Even if this liberal podcast received 1.1 million listeners per podcast, there are only two podcasts a week. Each podcast lasts less than one hour. Rush Limbaugh has 13.25 million cumulative listeners a week. Faris, who teaches political science at Roosevelt University, didn’t contact any of the conservative talkers he railed against, nor did he offer any listenership numbers to bolster his claims. While The Week is a commentary magazine, one would expect it would actually, you know, make a comparison when making a comparison. Chalk this up to more fake news. The electoral score … CNN’s Chris Cillizza once again proves that he is #FakeNews. This time he claims that since Donald Trump’s inauguration, Democrats are 6-0 in elections. Um … that’s demonstrably false at both the federal and local levels. Karen Handel, a Republican, beat Jon Ossoff in a Georgia race to replace Congressman Tom Price — that Democrats thought they would win. Also, on May 9, 2017, Republican Mayor Jean Stothert won reelection as the mayor of Omaha, Nebraska. The tweet was easily proved false. Hey Amazon, “What happened?” … Amazon was caught deleting one-star reviews of Hillary Clinton’s book-long whine “What Happened.” Many conservative authors took to social media to ask why their obviously fake one-star reviews stayed on the site. Amazon’s brass can moderate their site however they wish, but is that really the look a bookseller wants? Picking and choosing speech? PROGRAMMING NOTE: Thank you to everybody who reads this email. I truly appreciate it. I will be off tomorrow and there will not be an email. Regular programming will return Monday.